It wouldn’t be a Hoogs adventure without some drama. At dinner last night, the winds had picked up and there were thunder claps as we headed back to the hotel around 11:00. I didn’t hear any storm sounds overnight. At breakfast, Josh and I headed to the rooftop terrace to check on the weather. 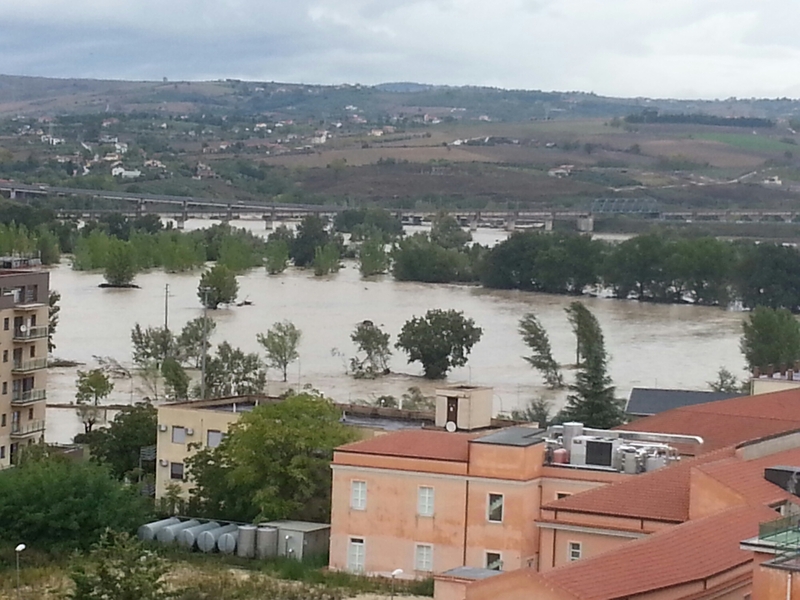 What we saw was a raging river and a town under water. You can see the water almost up to the deck on the railroad bridge. Apparently there were biblical rains during the night. Our plan for the day was to ride to Campobasso and then the mountain roads to a town near Rome so that we could get to the rental office by 10:30 to drop off the bikes. We had to find a routing out of town that got us across the swollen river and on our way. The Italian equivalent of the civil defense was all over the city, directing traffic. We got across the river fine but then ran into mud and debris covered roads from overnight flooding. It got worse. 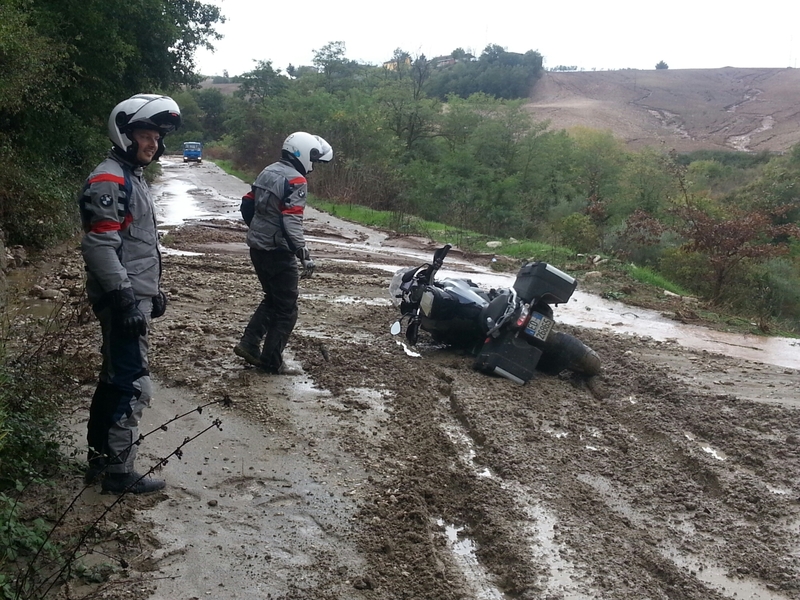 I came around a corner and found Josef’s bike horizontal in a huge mud puddle. We had to wade into shin deep sludge to get him upright and then steady the bike while be spun it around to extract it from the mire. Of course it spit goo all over us. The truck driver coming the other way in the picture told us the road ahead was worse. All the farm fields had washed across the roads. We limped back to the last small town where Josef begged the gas station guy for a bucket to wash off his bike. The power was out in the town and everyone was cleaning up the mess from the disaster. 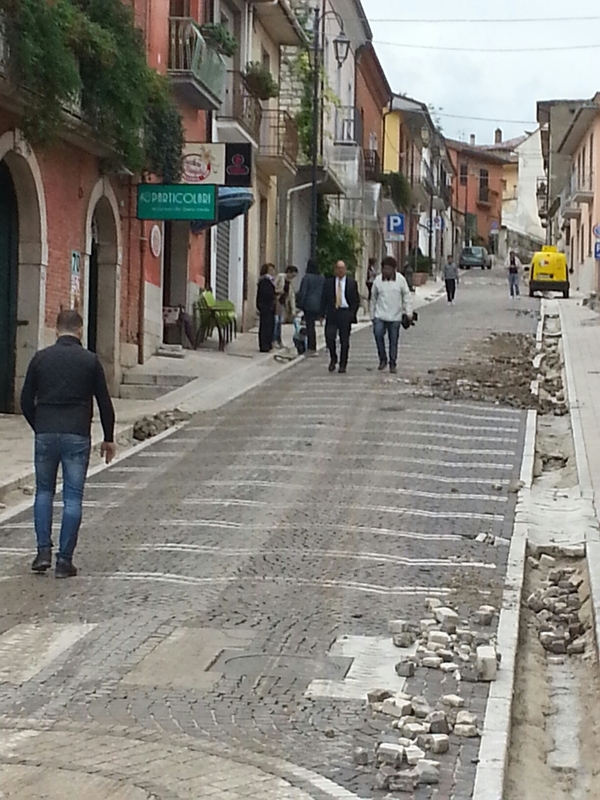 The water had washed down this street so hard and fast that it had pulled out the cobble stones. There was a pile the size of a Volkswagen in the gas station parking lot. After the bike cleanup, the townspeople gathered around to help us remap. 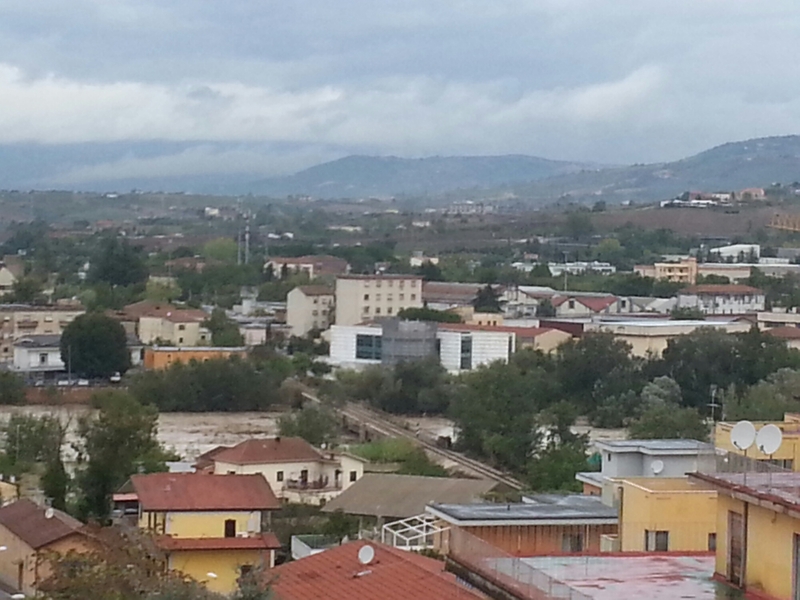 Our only option was to backtrack to Benevento, and it was starting to rain again. On the outskirts of Benevento, The authorities had the highway blocked. 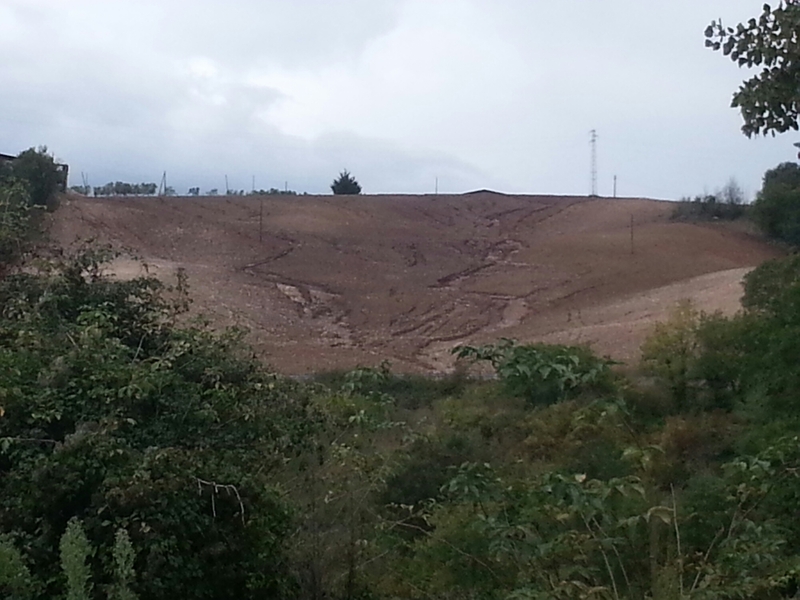 They told us the AutoStrada (and all the other roads) to Campobasso was closed and wouldn’t open for two days due to mudslides. The whole region is a disaster area. We would have to ride towards Naples (ugh) to find an open highway north. The rain was now coming down hard with standing water on the highway to complement the mudslides closing lanes. Not a good riding environment. I rode as cautiously as I could to avoid hydroplaning and had a death grip on the bars because of the low visibility and slippery conditions. After about an hour, we cleared most of the rain and took a breather in our old friend Cassino while we re- plotted our course. We decided to make our way to Avezzano, close enough to Rome and there would be some nice mountain roads to keep the day from being a complete disaster. The riding was indeed very nice and we got to Avezzano before dark, yay. A beer in the lounge and Napolitano style pizza for dinner. Tomorrow, up early to see Robert off as he heads towards home, riding 1100 kms back to Germany. He will likely encounter rain and snow. Then, we’ll be bolting for our bike drop on the west side of Rome.